Mark, there is a section on 'Kit Homes' in the July edition of the SelfBuild & Design journal in an article entitled 'Net Zero Carbon' (pages 75 and 76)that might interest you. I suspect the bit you are referring to in Brian and Sybil Rushbridge's article is a) a German prefab house costs £750/m2 upwards and that b) "crossing the Channel seems to change companies' prices dramatically." I am aware that Baufritz isn't the cheapest option out there. But we are not trying to build a cheap house. Compared to other architect designed one-offs, which these days seem to be costing around £1800/m2, I think it represents good value. The Rushbridges seem to be caught up on the "low energy houses need not cost more" argument. I have yet to be convinced by this. I don't think we spend enough on building our houses as it is. 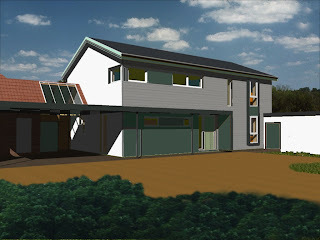 What we are going for here is a quality in a smallish footprint: the site could take a house twice the size, which could be built for the same overall total, but that seems to me to be missing the point of a low energy house. Size isn't everything, and when you start concentrating on £/m2, it's easy to lose sight of the difference between cost and value. Mark, the way I read it, the article you refer to actually suggests that purchasers check for possible variation in price for the same goods in two different countries. Also, I would think that the suggestion to check the energy standards is useful in helping purchasers decide what energy performance they want, and whether they want to opt for low purchase costs with permantly high running expenses, or higher purchase costs with low running expenses. These are sensible suggestions, I would have thought. That might be possible if you were buying an identikit house. But none of the ones being erected in the UK are lifted straight from the German handbooks. Check out these house 20% better then an A1 rated house, Is this possible?